ELAC’s seven appointed members work alongside 150 workgroup volunteers who focus on different aspects of the state’s early learning system. All this energy centers on providing early childhood care and education that is accessible, high-quality, and affordable to all families. How Are Children Ages 0-5 Doing Today? 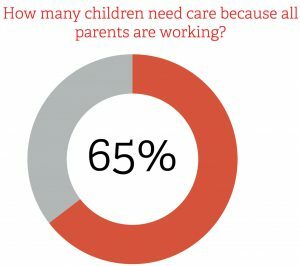 Of the 506,761 children in Indiana ages 0-5, 65% need care because all parents are working. This includes working parents who are single as well as households where both parents work outside the home. Of those children who need care, only 41% are enrolled in known programs. The other three-fifths of children are in informal care settings—with a relative, friend, or neighbor—where the quality of care is unknown. Of the young children who need care, only 15% are enrolled in high-quality programs. A high-quality program not only ensures that children are safe, but also supports their cognitive, physical, and social-emotional development for kindergarten readiness and beyond. What Are Some Of Indiana’s Accomplishments On Behalf Of Young Children? There are more high-quality early childhood care and education programs available. In 2012, Indiana had just over 700 high-quality programs. There are now almost 1,200. 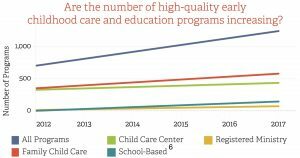 Today there are 4.5 times more children enrolled in high-quality programs than there were five years ago. Over half of the counties increased their number of high-quality programs. What Is The Unmet Need Identified In The 2018 ELAC Annual Report? 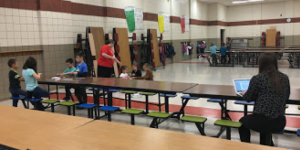 There are communities in Indiana with no high-quality programs. The tuition cost of high-quality early childhood care and education programs is unaffordable, and the available financial assistance for low-income families is insufficient. There is a lack of high-quality seats for infants. Only 7% of children ages 0-5 in high-quality programs are infants. As in past years, ELAC has published a full annual report, which includes statewide data on Indiana. 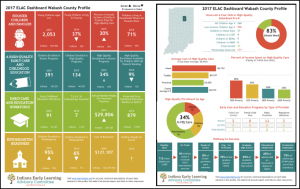 ELAC has also compiled updated 2018 county-level data for all 92 Indiana counties to aid local stakeholders and coalitions in their work. Use the map to select your county. You can review your county’s profile in an interactive dashboard or a PDF report! There is a newly created feature this year! 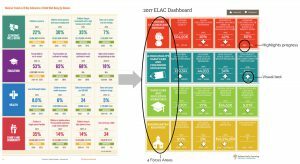 ELAC published an interactive dashboard with all of the data in the annual report—allowing you to learn more about specific data points and easily present data to stakeholders. There are also comparisons between counties to see how well your community is doing compared to others. Transform Consulting Group is proud to support ELAC’s work to help each of our youngest learners reach their full potential! Transform Consulting Group can also help your organization or coalition with data analysis, creating dashboards to visualize your data, and meaningful reporting. Contact us to multiply your impact! Why is a Program Evaluation Impact Team so Important? How does an organization know it’s meeting its goals and objectives? An outside team can be hired to put tools and systems in place, which is a good start, but investing money in outside consulting only can leave organizations floundering in a constantly evolving reality. What if instead of investing solely in an outside group, an organization invests simultaneously in its own people? It is exceedingly important to invest in the right team of people to help an organization to push forward, to evaluate and sustain systems, while keeping a “pulse” on the organization. That’s what an impact team does. 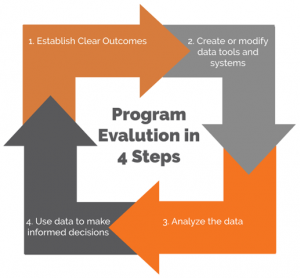 In a past blog, we talk about the 4 steps of a program evaluation. The impact team would work closely with the outside evaluator to complete the four steps and keep the evaluation cycle going beyond the consultation engagement! 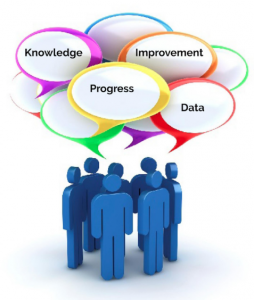 They are essentially your internal “CQI” or continuous quality improvement team. 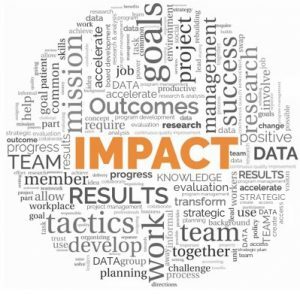 An impact team is a cross-cutting team of staff that come together on a regular basis (e.g., quarterly) to ask critical questions, review data, and make meaning of the information; basically, to integrate program evaluation into the organization. They would discuss how the data is being collected to ensure the processes and systems in place are being followed. They would also review the big goals identified in the logic model and discuss if the targets have been met and why/ why not. Lastly, and most importantly, they would identify data-informed recommendations to improve the outcomes. 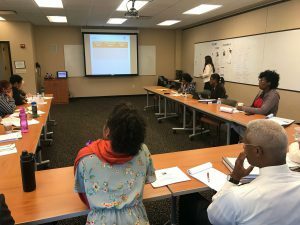 Transform Consulting Group worked closely with Center for Leadership and Development to implement a system for in-house evaluation and train their impact team to ensure integration of evaluation within the organization and cross-department alignment. Policies and procedures were put into place to guide system processes and outline impact team member roles and responsibilities. The team was trained on how to collect data using the agreed-upon tools. A data management plan and schedule were created to align with the organization’s programming schedule and keep the impact team on track with data collection and analysis throughput the year. This ensured new evaluation results would always be ready in accordance with important fundraising events and annual strategic planning sessions. Who should be on an impact team? The executive decision-makers? All management? Maybe just the staff who worked on the programs being evaluated? Only if you want a myopic view of your organization’s reach. The impact team should consist of staff at all levels to have different perspectives. Information will be interpreted differently by each person on the team based on their unique capabilities, experiences and strengths. What is interesting? What stands out? Some results may be more obvious to different members of the team. This is what makes a great impact team. Take time to think about the best people at each level of the organization and don’t be afraid to adjust those involved as things change. An impact team will be engaged in the most crucial elements of the organization. Make sure to include members capable of critical thinking and connecting the dots—systems level thinkers, not just task-masters. Those who can perform high-level analysis, problem solving, and decision making are essential, but don’t exclude those doing work on the ground floor. Their understanding of what it takes to execute the organization’s vision on a daily basis is invaluable. Build a team from all levels that is excited, engaged, and willing to be honest about what works and what doesn’t. This is the start of where the big decisions are made. The informational “tools” to make big decisions start with the evaluation data (the hard evidence) and the folks who can interpret what the data is saying. An organization’s impact team would present evaluation results and subsequent recommendations to the board and leadership team regularly. Organizations are equipped with make data-informed recommendations for decision making, such as modifying programming elements, letting go of a program, refining the target population, requiring more professional development for program staff, adjusting program dosage for participants, and other organizational or programmatic changes. Transform Consulting Group can help you create and sustain a winning program evaluation impact team for your organization. Please contact us today to learn more! Imagine your organization recently conducted a program evaluation. Data was gathered from one of the programs offered and an analysis of the data revealed your program outcomes were met, some even exceeded! This is exciting news and you want to shout it out from the nearest rooftop… We understand this urge, but there are better (and safer) ways to share your evaluation data. 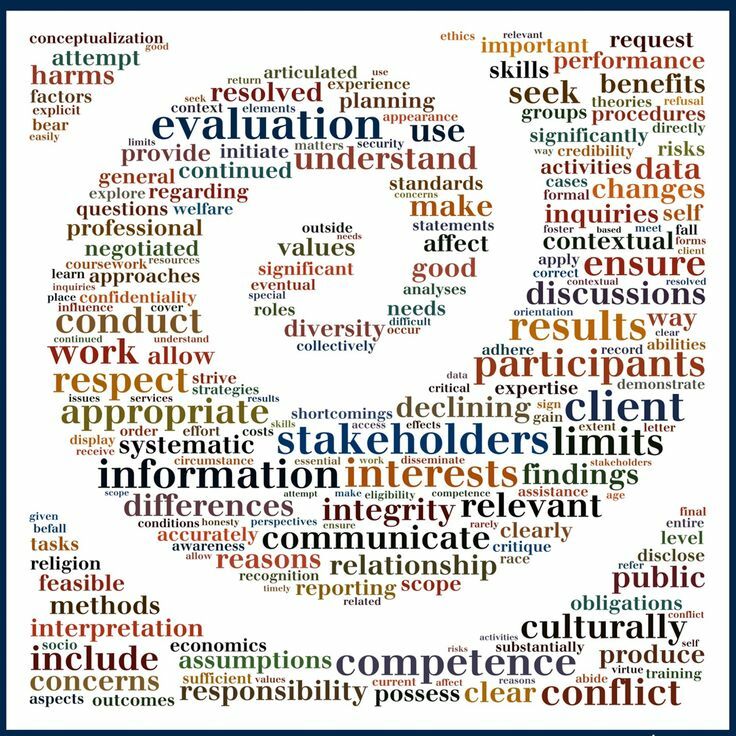 In this blog, we discuss different audiences with whom an organization might share their evaluation results and the benefits of sharing them. Stay tuned for a future post discussing how to share your evaluation data. At Transform Consulting Group, we love seeing organizations use data to measure and achieve success! We also love helping organizations “visualize” success in easy-to-understand ways using simple charts and graphics. Once these data visuals are audience-ready, what are the next steps? 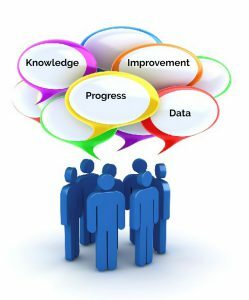 Does an organization need to be intentional about sharing program evaluation data? Why? Data is only as good as how it is used. If an organization collects data, analyzes it and makes beautiful visuals with it, but few people actually see the results, what is gained from the experience? Probably not much! This connects back to a blog we wrote called, 4 Steps to Complete a Program Evaluation. Step number four in the process is to discuss the results of an evaluation and make data-informed decisions. In order to do this, evaluation data must be shared with the right people. Our team typically compile a summary report and/or slide presentation of an organization’s evaluation data for stakeholders to review the results and discuss their implications. A stakeholder is anyone who has a “stake”—an interest, concern, or investment—in an organization and/or program achieving (or not achieving) its goals. We categorize data sharing into two different “buckets” -internal and external. As it sounds, sharing data internally is with folks on the inside of an organization, and external data sharing is with folks on the outside looking in. Within each bucket, we’ve identified three important stakeholder groups and how sharing evaluation results can be beneficial, no matter what the data “says”. 1. Employees: It would be challenging to find a dedicated employee who would not care to see evidence of their daily efforts actually paying off and leading to positive change. 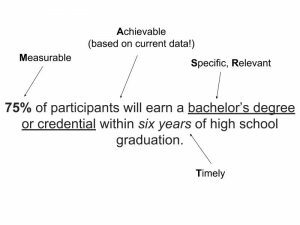 The achievement of program outcomes reflected in data can help validate the combined efforts of all staff involved in a program’s design (if applicable) and delivery. It is important to share evaluation results with staff at all levels and not just employees at the top. Too often, we see that the information does not trickle down. Sharing, showcasing and celebrating success builds morale and encourages staff to continue doing great work. In the business sector, this would be akin to celebrating a top-sales month! On the other hand, results of an evaluation may reveal that a program is not achieving its intended outcomes and uncover potential reasons why not. Evaluation data can “shed light” on issues that staff and/or leadership were not even aware of that could hinder the ability to make an impact. Based on sharing these results, employees will know to expect workflow or programmatic changes in the near future without confusion or surprise. At TCG, we recently worked with an organization that provides college and career readiness counseling for high-school students to evaluate their 8-week summer program. During orientation, students were given a pre-survey to assess their knowledge of college and career readiness subject matter before participating in the program. On the last day, students were given a post-survey to measure knowledge gained as a result of completing the program. Evaluation data was presented to program staff and leadership in easy to understand charts and graphs. Staff became excited when they saw how much college and career readiness knowledge students gained as a result of participating in the program! They were also glad to find out which areas students reported knowing the least about. As a result, staff could strengthen those areas of the program prior to the next round of incoming students. 2. Volunteers: Organizations that depend on volunteer work are always on the lookout for more help. Unfortunately, unpaid labor can be hard to come by, especially if volunteers don’t feel like their time and effort is making a difference. If an organization can show community impact as a result of volunteerism, their volunteers are more likely to feel validated and remain committed to the organization. Then they may even recruit more volunteers! In this case, evaluation data helps to promote satisfaction and the feeling of reward. Volunteers are motivated to stay put and not seek out other volunteer opportunities when they know that their time and talent is making a difference. 3. Board of Directors: The Board can use evaluation data to begin planning and discussing the future of an organization. If the data supports outcomes consistently being met, a Board may decide to expand the program’s service delivery to a larger area or broader audience. If the expansion is successful, the organization sustains a larger community impact and the Board (hopefully) feels a sense of accomplishment and pride in the organization. For evaluations resulting in unmet program outcomes, the Board may recommend program model changes, or commit to focus on a problem area (i.e. staff professional development) during the upcoming year. Either way, sharing program evaluation results with Board members equips them to make informed decisions about what is best for the organization going forward. 1. Funders: Funders want to see a return on their investment into any organization. Many funders require organizations to conduct program evaluations to remain accountable for the results that their funds are directly supporting. Bottom line, funders want to know if the program is worth the resources that it costs. Evaluation results help “quantify” worth for funders by showcasing to what extent the desired program changes are occurring. If a program performs as expected, it is likely that funding dollars will keep flowing. Alternatively, if evaluation data shows program outcomes not being met and insignificant or no change is occurring, a funder may decide not to invest or discontinue investing in an organization. Funders are often supporting multiple organizations at once and want to feel confident their money is well-spent and producing the best results! 2. Partners: Evaluation data may help make a case for two or more organizations to join forces and provide combined programs or services within a community to maximize impact. Sharing data can be a positive step in the direction of collaborating and working towards common goals. Local programs may unknowingly be competing for clients, resources or limited funding. Some are likely struggling to meet goals. Awareness of such issues, made apparent through evaluation data, could spark ideas to collaborate and leverage partnerships to provide joint programming. The result? Sharing data may lead organizations to do what is best for the community, while also doing what is best for their budget! Ideally, routine program evaluation and data sharing will keep organizations accountable to each other in the future. On the other hand, evaluation data can show when partnerships are no longer working and should be realigned or dissolved. 3. The Public: Sharing data with communities helps to legitimize an organization’s purpose in the public eye. Program evaluations are one way to demonstrate community impact. Evaluation data goes a step farther to show how much impact an organization or program is making. Nonprofit organizations are public agencies with a responsibility to communicate back to the public about the goodwill that they are making from the public’s investment in them! Foundations, grant makers and other funders research shared public data about an organization or program to determine whether or not to invest in it. Evidence of successful programming can suggest an organization itself is well-managed. This inspires confidence that funding dollars will also be used wisely and generate the greatest return on investment. Internally, sharing evaluation results can galvanize an organization–arming employees (program staff and management) and the Board of Directors with data they need to ensure program outcomes are being met and take appropriate actions when issues arise. External stakeholders use data to verify an organization’s credibility and hold it accountable to the outcomes it seeks to achieve. Ultimately, stakeholders use data to keep an organization on track to accomplish its overall goals. It’s hard to win a game if your team has no idea of the score—or even worse, what game they are playing. Sharing evaluation data helps to keep an organization’s impact transparent and everyone involved on the same page. 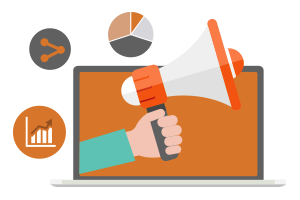 Stay tuned for our next blog in this series about how to share data and use it to tell your story within different communication channels! Talk with one of our team members today and learn how you can get the word out about your evaluation results! Annual Report – At a minimum, you should annually produce a report that summarizes your organization’s impact in the community. However, we strongly encourage you to rethink your traditional annual report. Check out these olds posts (here and here) for some inspiration! Social Media – Similar to creating “data sound bites” in your email signature, similar data posts can be created for your organization’s social media pages on Facebook and Twitter. Just make sure to limit your jargon and make the post user-friendly. Collateral Materials – Too often, organization’s marketing materials focus on the services and programs (what you do) and not the result of those services and programs (aka, your outcomes!). Refresh your marketing materials to include both of these critical items – the programs offered and the impact that these programs have in the community! Grants and Fundraising – One of the best ways to increase an organization’s revenue and funding is to share the results with your funders via grant proposals, grant reports and fundraising events. The evaluation data can be useful to both highlight the great work you are doing (aka – give us more money to expand our impact) as well as justify the need for more money (aka – we need better staffing, curriculum, etc. to accomplish our goals). Transform Consulting Group is passionate about helping organizations get clear on their mission and goals as well as have the right tools and systems in place to monitor the accomplishment of your goals. Do you need help evaluating your programs or communicating your impact? Contact us today for a free consultation!